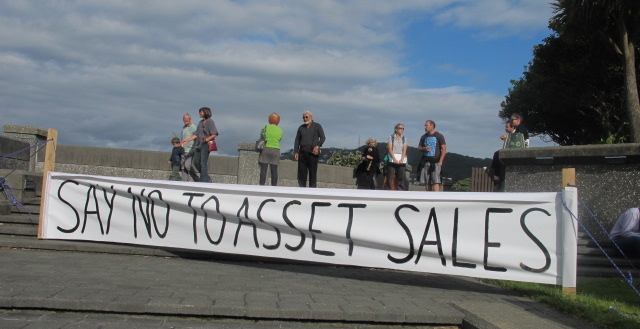 There was an evening rally against asset sales in Wellington on February 13. As a gathering of the committed the attendance was quite good. Estimates vary, but 400 would be about right I think. The unions – which could potentially turnout thousands of members against privatization – are not able to do so in their present state of passivity. Indeed, the unions were barely visible. There was not one union speaker, and no Labour Party speaker either, for that matter. The character of the rally did not represent the organized labour movement – that means unionised workers and members of parties based on the working class. Without union leaders thundering mass action to stop sales or even an MP promising to take assets back into public ownership on the election of a Labour government, this rally gave little sense of direction for the anti-asset sales campaign. If neither industrial action nor Labour Party reforms are on offer we are left only with the forlorn hope of a possible referendum. This vacuum of leadership has given space to a poisonous, racist nationalism. The very first speaker at the rally, Wellington Tenths Trust managing trustee Peter Love, of Te Atiawa, set the tone with a dreadful anti-Chinese speech. One of the many other speakers, Maori Council chairman Manu Paul, followed this up with an appeal to Winston Peters to stop the sales, saying he is the only politician with enough courage to do so. Perhaps Peters could combine this measure with his fellow MP Richard Prosser’s plan to ban Muslims from using air travel. Ironically, Peter Love was last in the news for (rightly) calling Prosser’s Islamophobic comments racist. But it is not foreigners that are the problem. The instigators of the privatization mania are home-grown. It was Labour who first introduced privatisation in the 1980s, now it is mainly National Party MPs. In both cases, these politicians represent the interests of the New Zealand rich. The pervasive nationalism in the campaign serves only to disorientate by obscuring sight of the real enemy and consciousness of the privatization policy as a part of the conflict between classes. Peter Love was followed at the mic by his grand-daughter Kaira Love, who claimed to represent New Zealand’s youth. She continued the nationalism by telling us how much she loved New Zealand and what a paradise the country is. But what kind of paradise is it for New Zealand’s disproportionately Maori poor in this most liberalised of economies? After this bad start the rally improved with Wellington Mayor Celia Wade-Brown’s speech, but she could only offer the referendum petition as a way forward. There were many other speakers but no leadership to give the campaign a more positive direction. This rally would not have given John Key a sleepless night. The anti-privatization sentiment that undoubtedly exists among working people is yet to be mobilized.